My neighbors’ dog, Wrinkles, died today. I cried. And cried. And cried. One of those cries when you wonder if it will ever stop. This wasn’t even my dog! Oh, how I rue that day. But I saw Wrinkles and her two sisters all the time. They knew who I was when they saw me. I felt like we were at least related. Wrinkles was just fine only two days ago. 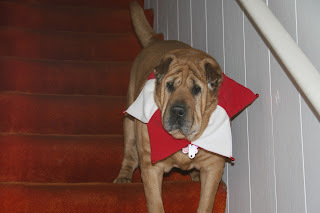 Yesterday, she came down with Shar Pei fever, and this morning we got the news. She was 13, well past her 10-year life expectancy, but you would never know it to meet the vibrant, playful little Shar Pei mix. She would trot jauntily down the road, always checking to see if my chocolate lab was out. If so, they would race across long expanses of road and lawn to meet, acting like it hadn’t just been an hour ago that they’d last seen each other. It was adorable. Wrinkles’ owner likened it to a Kermit and Miss Piggy love scene. Wrinkles was so loveable that her owners had her trained as a therapy dog and she would visit Hospice patients to brighten their day. Her visits meant so much to these people that one time she was even mentioned in a patient’s obituary. I am now progressing through the various stages of grief and have managed to stop crying, but how I will miss that silly little dog. Beware, the Ides of March. We all ;love our pets, but this dog was a truly unique creature. She was sweet, kind, stubborn, loving and my dog's good friend. We lost one of the good ones, but bless our neighbors who rescued her and gave, and her sister, a great life. We should all be as good as our dogs think we are. Words to live by, Sue.